The epidemiology of E. ruminantium infection in extensively managed young animals is not adequately understood. Thus in this study, we monitored the onset (age at first infection) and kinetics of E. ruminantium infection and antibody response in extensively managed newborn lambs and kids at three sites in The Gambia. We used a nested pCS20 PCR and MAP1-B ELISA in a longitudinal study to monitor the onset (age at first infection) and kinetics of E. ruminantium infection and antibody response respectively, in 77 newborn lambs and kids under a traditional husbandry system at three sites (Kerr Seringe, Keneba, Bansang) in The Gambia where heartwater is known to occur. The animals were monitored for field tick infestation and the comparative performance of the two assays in detecting E. ruminantium infection was also assessed. The infection rate detected by pCS20 PCR varied between 8.6% and 54.8% over the 162-day study period. Nineteen per cent of the animals in week 1 post-partum tested positive by pCS20 PCR with half of these infections (7/14) detected in the first 3 days after birth, suggesting that transmission other than by tick feeding had played a role. The earliest detectable A. variegatum infestation in the animals occurred in week 16 after birth. Antibodies detected by MAP1-B ELISA also varied, between 11.5% and 90%. Although there is considerable evidence that this assay can detect false positives and due to this and other reasons serology is not a reliable predictor of infection at least for heartwater. In contrast to the pCS20 PCR, the serological assay detected the highest proportion of positive animals in week 1 with a gradual decline in seropositivity with increasing age. The pCS20 PCR detected higher E. ruminantium prevalence in the animals with increasing age and both the Spearman's rank test (r s = -0.1512; P = 0.003) and kappa statistic (-0.091 to 0.223) showed a low degree of agreement between the two assays. The use of pCS20 PCR supported by transmission studies and clinical data could provide more accurate information on heartwater epidemiology in endemic areas and single-occasion testing of an animal may not reveal its true infection status. The view is supported because both the vector and vertical transmission may play a vital role in the epidemiology of heartwater in young small ruminants; the age range of 4 and 12 weeks corresponds to the period of increased susceptibility to heartwater in traditionally managed small ruminants. Heartwater is an infectious disease of ruminants caused by a rickettsia, Ehrlichia ruminantium, and transmitted by ixodid ticks of the genus Amblyomma. The disease is endemic in sub-Saharan Africa and on some islands in the Caribbean. The epidemiology of heartwater in young small ruminants is not adequately understood. In heartwater-endemic areas where extensive husbandry systems exist and tick control is absent or limited, the numbers of Amblyomma ticks are high and animals are subjected to almost continuous tick, and presumably E. ruminantium challenge . Several researchers postulated that the existence of endemic stability for E. ruminantium and tick-borne infections in general may be dependent on infection, by tick transmission, to the very young host during a period of reduced susceptibility to clinical disease [2–4]. It has been reported that newborn calves, lambs and kids possess an inverse age-related resistance to heartwater, which is independent of the immune status of the dam[5, 6]; this resistance has been reported to be of short duration, lasting 9 days in lambs  and 2 weeks in kids . However, the concept of endemic stability in relation to heartwater in extensively managed small ruminants in The Gambia (local dwarf sheep and goats) is not completely understood and may not be the same as in the case of indigenous cattle. Mortality due to heartwater has been reported frequently in the first two species; and a 12-month risk assessment in The Gambia showed that indigenous small ruminants (local dwarf sheep and dwarf goats) experienced a much lower A. variegatum tick attachment rate of 0.76 ticks/animal than N'Dama cattle (9.36 ticks/animal) (B. Faburay et al., unpublished data). Moreover, evidence has been provided of possible occurrence of vertical transmission of E. ruminantium in calves  and that initial transmission of heartwater to calves may not always be by the tick vector , findings which could also apply to small ruminants. Diagnostic tests targeting pCS20 sequences have long been considered specific for E. ruminantium [11, 12] and recent advances in molecular diagnostics resulted in the development of a specific and sensitive pCS20 polymerase chain reaction (PCR) assay for detection of all known strains of E. ruminantium in ticks [11, 13]. Previous experiments showed that the pCS20 PCR could detect E. ruminantium carrier infections in animals . Preliminary random testing of suspected carrier small ruminants in a heartwater-endemic area (Keneba) in The Gambia using a nested pCS20 PCR detected a 60% (n = 14) infection rate; moreover all samples collected from clinically sick goats maintained on-station at ITC (Kerr Seringe), and confirmed as heartwater cases post mortem, tested positive by the same assay (B. Faburay, unpublished data). In the past, serological tests for detection of antibodies to E. ruminantium suffered from poor specificity due to cross-reactions with other ehrlichial agents [15–17]. Although the MAP1-B ELISA  has been reported to detect false-positives in heartwater-free areas attributed to cross-reactions with closely related species [18, 19], the assay has higher sensitivity compared to other serological tests to detect E. ruminantium antibodies in ovine and caprine sera [20, 21]. This increased sensitivity is attributed to the comparatively longer persistence of MAP1 antibodies in these species [17, 20]. In the present study, we monitored the onset (age at first infection) and kinetics of E. ruminantium infection and antibody response in extensively managed newborn lambs and kids at three sites in The Gambia where heartwater is known to occur  using pCS20 PCR, and also compared the performance of the pCS20 PCR and indirect MAP1-B ELISA in detecting heartwater infection in small ruminants. Seventy-seven small ruminants (local dwarf sheep and dwarf goats) were monitored from birth for up to 162 days at three sites in The Gambia: Kerr Seringe (13°43' N, 16°72' W), Keneba (13°20' N, 16°01' W) and Bansang (13°27' W, 14°40' N). The animals at Kerr Seringe and Keneba belonged to the International Trypanotolerance Centre (ITC), whereas those in Bansang were animals of local smallholders. A recent serological study showed presence of MAP1-B specific antibodies at all three sites . In the presence of A. variegatum ticks in these areas , we presume that these antibodies are due to exposure to E. ruminantium. Kerr Seringe is located in the western part of The Gambia on the coast, whereas Keneba is about 150 km east of Kerr Seringe. Bansang is located 150 km further east from Keneba. Monitoring of death in extensively managed small ruminants in Kerr Seringe from 1996 to 1999 showed that 17.9% of deaths in local dwarf sheep and 12.5% in local dwarf goats were associated with heartwater; and in Keneba these figures were 36% and 25% for sheep and goats respectively . Although cases of mortality due to hearwater have been observed in sheep and goats in Bansang area, records of these deaths were not kept. E. ruminantium tick infection rates at these sites have been described previously . The study animals comprised 29 lambs at Kerr Seringe, 21 kids and 13 lambs at Keneba and 10 kids and 4 lambs at Bansang. All newborn animals and their dams were maintained under a traditional husbandry system without acaricide treatment, except for the dams at Kerr Seringe, which had received regular monthly acaricide treatment for about 10 months before the start of this study. Acaricide treatment of all animals was discontinued during the study period. All newborn lambs and kids, together with their dams, were maintained under the traditional husbandry system  without acaricide treatment. Under this system, animals were allowed to wander freely around the homestead for feed and food residues and/or graze in the bush during the day. Newborn kids and lambs were mostly tethered until they reached the age of 2 to 3 weeks of age to gain strength to graze with their dams in the bush. At night, depending on the site, the animals were usually penned in sheds or barns. Sampling and monitoring started in mid-February 2002, following the peak incidence of A. variegatum nymph attachment , and ended in mid-July 2002, the beginning of peak abundance of the adult instars. At the study sites, peak activity of Amblyomma nymphs occurs from November to January, which is followed by rapid decline or virtual disappearance of the tick population (both nymphs and adults) until May/June when adult ticks start to appear on animals , most frequently on cattle. Whole blood was collected with and without anticoagulant (EDTA) from each newborn animal on the day of birth or at the latest within 3–10 days of birth, and thereafter weekly and fortnightly for testing by pCS20 PCR and MAP1-B ELISA respectively. All newborn animals (0–10 days of age) were examined for ticks at the time of first sampling. Thereafter, selected animals (5 kids and 5 lambs at Keneba, 5 lambs at Kerr Seringe and all 16 neonates at Bansang) were examined weekly for tick infestation by examining the whole body. Post mortem examinations were carried out on all animals that died; and Giemsa-stained brain smears were examined for the presence of E. ruminantium inclusions in brain capillary endothelial cells . The pCS20 PCR is the method of choice for detection of E. ruminantium  and analysis by nested pCS20 PCR assay as described below was carried out on the brains of animals, which showed hyperthermia and suspicious clinical symptoms characteristic of heartwater prior to death but were negative microscopically. Blood with EDTA was introduced into plain glass capillary tubes and centrifuged for 5 minutes at 14 000 × g to separate the buffycoat using Hawksley® HaematoSpin 1400. The tubes were broken and the buffycoats were applied to Whatman® filter paper #3 or #4 and allowed to dry at room temperature. DNA was extracted by the Modified Plowe extraction method . DNA from brain tissues of dead animals was extracted using the protocol for purification of total DNA from animal tissues in DNeasy® Blood and Tissue Handbook (QIAGEN, Hilden Germany). Previous experiments already showed the specificity of the pCS20 PCR assay for E. ruminantium using AB128 and AB129 primers [12, 13]. A nested PCR was carried out as described previously . Briefly, AB128 and AB129 primers  were used as internal primers. AB129 was also used as the external reverse primer, while ITM130 (5' TCAATTGCTTAATGAAGCACTAACTCAC 3') was used as the new external forward primer. PCR amplification was carried out in a 25 μl volume comprising 5 μl DNA sample, 50 mM KCl, 10 mM Tris-HCl (pH 8.3), 1.65 mM MgCl2, 400 pmol of each of the deoxynucleoside triphosphates, dATP, dCTP, dGTP and dTTP, 0.4 U of Taq polymerase, 40 pmol of each primer. After a denaturing step of DNA at 94°C for 3 min, the first round of amplification was carried out using the following conditions: 39 cycles of 30 sec denaturation at 94°C, 45 sec annealing at 62°C and 1 min elongation at 72°C and a final extension of 10 min at 72°C. Aliquots of 0.5 μl of PCR product from the first round amplification were transferred as template to a second round of PCR at 84°C (hot start principle). The second round consisted of 25 cycles of the same PCR conditions as in the first round except for the annealing temperature, which was set at 58°C. In each PCR run, positive and negative controls were included. Positive controls were derived from E. ruminantium (Senegal isolate) DNA obtained from cell culture-derived organisms and negative controls were reagent blank samples without DNA. The PCR amplified a 279 bp fragment of open reading frame 2 of the 1,306-bp pCS20 sequence. Amplicons were separated by 1.5% agarose gel electrophoresis, stained with ethidium bromide, and visualized under ultraviolet light. Serum was separated by centrifugation from the blood samples collected without anticoagulant, and stored at -20°C until required. The E. ruminantium MAP1-B ELISA was carried out as described previously [17, 31]. The assay has been shown to have high sensitivity for detection of E. ruminantium antibodies  particularly in small ruminants [18, 20, 31, 33] with a specificity of 98.9% and 99.4% for caprine and ovine sera respectively [17, 34]. Each serum sample was tested in duplicate. For sheep, each test included duplicate positive control sera obtained from a heartwater-naïve sheep of the Tesselaar breed experimentally infected with the Senegal isolate of E. ruminantium  at the Faculty of Veterinary Medicine, Utrecht, The Netherlands. Duplicate negative control sera were obtained from the same sheep prior to infection. Similar controls were obtained from a Saanen goat and included in duplicate for testing goat sera. Species-specific second step IgG antibodies conjugated with horseradish peroxidase (Nordic Immunology, Tilburg – The Netherlands) were used. Optical densities of the ELISA tests were measured using a Titertek Multiskan® ELISA reader (Titertek, Flow Laboratories Inc.) at 405 nm wavelength. For each plate, the cut-off value was calculated as two times the percentage positivity of the negative control serum relative to the positive control serum [14, 17]. The method of Kaplan-Meier survival estimate was used for survival analysis. Results of total tick counts carried out weekly on animals at each of the three sample sites are shown in Table 1. The highest level of A. variegatum infestation was recorded in animals at Keneba, with a total of 40 ticks, consisting of 2 nymphs and 38 adult ticks, detected throughout the observation period. Lower levels of A. variegatum infestation were recorded at Kerr Seringe and Bansang, with 1 nymph and 2 female A. variegatum ticks detected respectively. Amongst the young lambs and kids that died of heartwater, A. variegatum ticks were recorded on 1 animal (#1317) at Kerr Keringe and 3 animals, #4333, #4338 and #4340, at Keneba (Table 2 and 3). Generally, tick infestations occurred at the end of the observation period in the early rainy season (mid-June and July); and infestation was first detected on animals at week 16 after birth. The pCS20 PCR assay detected E. ruminantium DNA in 57 out of the 77 animals at least once during the study period. Fifteen animals (excluding those that died), 9 in Kerr Seringe, 3 in Keneba and 3 in Bansang, remained negative by this test throughout the study (Table 2, 3 and 4). Data for a number of animals at different age levels were unavailable. Batches of some buffycoat extracts on filter paper (for DNA) stored in the freezer were soaked with water due to a freezer failure rendering some samples unsuitable for further analysis; the batch of samples of level 6 in Kerr Seringe was particularly affected (Table 2). Absence of serological data for some animals at different time periods was mainly due to erasure of ink labels on the serum cryotubes during handling and storage making them unidentifiable. Such samples were excluded from further analysis. The highest number of PCR-positive animals was observed at 78 to 98 days of age. Of the 9 animals (6 kids and 4 lambs) that were sampled immediately after birth (0–3 days) at Keneba, 6 tested positive by PCR; at Bansang, 1 animal was positive, whereas none tested positive at Kerr Kerr Seringe (Table 5). Nineteen per cent of the animals sampled after birth (from day 0 to 10 days), tested positive by PCR (Table 6). The serological assay detected the highest proportion of positive small ruminants (90%) at week 1 of age (0 – 10 days). A decline in the number of serologically positive animals was observed with increasing age (Table 6). The performance of the pCS20 PCR and the MAP1-B ELISA tests in detecting E. ruminantium in lambs and kids of the different age categories are outlined in Tables 2, 3, 4 and 5. All 7 neonates, between 0 and 3 days age range detected positive by PCR, were correspondingly serologically positive (Table 5). Four of these animals (4321, 4323, 4324 and 338) remained intermittently PCR and MAP1-B positive in subsequent weeks (Table 3 and 4) suggesting persistence of infection. E. ruminantium antibodies could not be detected in three PCR-positive neonates (4318, 4319 and 4325) after the first two weeks until the end of the study (Table 3). Assessment of agreement between the two assays by method of determining kappa statistic is shown in Table 7. The kappa coefficient ranged from -0.091, indicating agreement less than is expected by chance, to 0.223, suggesting fair agreement, between the two assays (Table 7). Global comparison of the results by Spearman's rank test showed that the two assays did not always agree (r s = -0.1512; P = 0.003) and data (Table 2, 3, 4 and Table 6) showed that the pCS20 PCR detected higher E. ruminantium infection rates with increasing age in field-exposed small ruminants. For example, a number of animals (#1301, #1302, #1316, #1318, #4325, #2317 and #2318) that tested PCR-positive at 99 to 162 days of age were correspondingly (the same age interval) negative by MAP1-B ELISA. The serology results showed that most neonates tested between 0–3 days of age carried antibodies to MAP1-B antigen of E. ruminantium (Table 5). Fifteen animals (10 lambs and 5 kids) died during the course of the study, between 28 and 147 days (Table 2, 3 and 4), representing a crude mortality rate of 19.5% (15/77); nine deaths (Figure 1; Table 2, 3 and 4) were confirmed heartwater-associated by detection of E. ruminantium in brain-crushed smears (6 deaths) or detection of E. ruminantium-specific pCS20 sequences in brain tissue DNA extracts (3 deaths). The 3 deaths confirmed by PCR occurred in Keneba and the lack of Giemsa-stained brain-positive results was attributed to poor storage of the brains prior to shipment to the laboratory for analysis. The three animals, however, showed clinical symptoms (hyperthermia, nervous symptoms) prior to death, and clinical pathological changes (hydropericardium, hydrothorax) at post mortem, which although not pathognomonic but are characteristic for heartwater. Overall case mortality rate for the 3 sites was 11.7% (9/77). At Kerr Seringe, the crude mortality rate was 17.2% (5/29) and case (heartwater) mortality rate was 6.9% (2/29); Keneba showed a crude mortality rate of 29.4% (10/34) and a higher case mortality rate of 20.6% (7/34), which could be associated with the high tick attack rate recorded at this site; in contrast to Bansang, no mortality occurred amongst the animals during the study period (Table 2, 3 and 4). Six animals were negative for E. ruminantium, and death was attributed mainly to coccidial or clostridial enteritis. Of the 9 animals which died of heartwater, 6 were previously positive for E. ruminantium by both PCR and MAP1-B ELISA. Five of the 9 animals that died of heartwater (#4305, #4334, #4338, #4320 and #4340) showed a first positive PCR test after 21 days of age (Table 2, 3 and 4) outside the brief period of inverse age-related resistance. Survival analysis (Figure 1) showed the frequency of mortality due to heartwater among extensively managed small ruminants to be higher in animals aged between 4 and 12 weeks. Heartwater mortality data: Kaplan-Meier survival estimate. The present study used pCS20 PCR to monitor the onset (age at first infection) and kinetics of E. ruminantium infection in neonatal lambs and kids maintained under a traditional husbandry system in three major locations of livestock production in The Gambia where heartwater is known to occur. It also compared the performance of the pCS20 PCR and indirect MAP1-B ELISA in detecting E. ruminantium infections in small ruminants. The prevalence of infection detected by pCS20 PCR varied between 8.6% and 54.8% over the 162-day study period. Nineteen per cent (14/73) of the animals in week 1 post-partum (0–10 days of age) were positive by pCS20 PCR. Half of these infections (7/14) were detected in the first 3 days of life (Table 5), suggesting that transmission other than by tick feeding had played a role. In this study, the earliest detectable A. variegatum infestation occurred in week 16 (Table 1). A plausible explanation of this finding is that vertical transmission of E. ruminantium from the dam to the offspring could possibly be occurring in small ruminants maintained under the traditional husbandry system. Vertical transmission was demonstrated to occur in cattle in Zimbabwe under natural field conditions , although the mode of transmission, either in utero or with colostrum, remains to be elucidated. Many tick-borne pathogens related to E. ruminantium, such as Anaplasma (Ehrlichia) phagocytophilum , E. risticii , Anaplasma spp. and Coxiella burnetti  can be transmitted in utero. Interestingly, in our study, most of the neonatal infections detected by pCS20 PCR occurred in animals of 0 to 3 days of age and were located in Keneba (67%, 6/9; Table 5) where there is a comparatively high A. variegatum tick abundance  and minimal or no tick control was practised. The traditional management system of small ruminants in The Gambia substantially diminishes the likelihood of tick infestation of neonates at or immediately after birth. Parturitions at Keneba and Kerr Seringe occurred in pens, which were regularly cleaned; and at Keneba all births happened precisely between 11 March and 8 April, coinciding with the period of significant decline in Amblyomma nymphs (or near complete disappearance) and least activity of Amblyomma ticks . Furthermore, the period required for transmission of E. ruminantium to occur after attachment of an infected tick to a susceptible host is estimated between 27 and 38 hours for nymphs and between 51 and 75 hours for adults , and it is highly unlikely that E. ruminantium transmitted to neonates at birth through tick bite could appear in the blood stream on the very day of or the following day after birth and detected by PCR. Against this background, it is postulated that vertical transmission of E. ruminantium possibly occurs in traditionally managed small ruminants and there is increased likelihood of this occurrence under conditions of medium to high tick challenge in the absence of, or with minimal, tick control. Interestingly, based on the number of PCR-positives, the phenomenon appeared to be more evident in Keneba (Table 5), a site located in the western part of The Gambia characterized by comparatively high rates of E. ruminantium tick infection  and tick attachment . Bansang, which is in the eastern part of the country with low rates of tick infection and tick attachment [22, 23], showed only 1 positive case. At Kerr Seringe, none of the neonates tested positive (Table 5). The latter site is also located in the western part of the country characterized by high rates of tick infection and tick attachment; and the absence of positive tests in the neonates was attributed their dams being subjected to regular treatment with acaricide as described above. Intensive use of acarides in indigenous livestock results in disruption of endemic stability to tick-borne diseases through disruption of infection by tick transmission [42–45]. It was highly likely that regular acaricide treatment of dams at Kerr Seringe resulted in significant reduction of infection intensity that was required for transmission of infection from dam to offspring to occur. Alternatively, the pCS20 PCR could be detecting E. ruminantium of low pathogenicity or an as yet uncharacterized related organism in these animals, which does not cause disease  and is transmitted in utero, neonatally, or by some other route. It should be mentioned that the present study was not designed to demonstrate the occurrence of vertical transmission of E. ruminantium in traditionally managed small ruminants but the findings herein strongly suggested plausibility of the phenomenon and should stimulate further investigation and confirmation through tick feeding experiments. Additionally, it was observed that a significant number of animals tested negative in day-11 to 21-age range by PCR and later became positive in day 22 to 49, with some animals demonstrating intermittent positivity throughout the study period suggesting that the level of E. ruminantium rickettsaemia in the peripheral blood fluctuated and sometimes it was not possible to detect infection . Presuming that heartwater infections were the cause of the sero-positive reactions, prevalence of E. ruminantium infection detected by MAP1-B ELISA also varied, between 11.5% and 90%. However, serological assays, generally, unlike PCR, do not show infection status of an animal and only provide information about previous exposure to infection. In contrast to the pCS20 PCR, the serological assay detected the highest proportion of positive animals in the first week of age (0 – 10 days). This was followed by a gradual decline in seropositivity over the 162-day study period with increasing age (Table 2, 3, 4 and Table 6), suggesting widespread presence of maternal antibodies in neonatal lambs and kids born to immune (since they were raised in tick-infested areas exposed to continuous tick challenge) dams maintained under the traditional husbandry system. A similar decline in antibody levels detected by a different serological test was reported over the first 2–3 months of life in traditionally managed calves, lambs and kids in Ghana . The MAP1-B ELISA has high sensitivity for ovine and caprine sera [17, 18, 20] but is less sensitive for bovine sera, especially in cattle subsequent to the first seroconversion [14, 33, 47]. However, in the present study, some animals that tested positive by both MAP1-B ELISA and pCS20 PCR later became intermittently negative by MAP1-B ELISA. This suggests the possibility of upregulatory-downregulatory effect on the production of antibodies as reported to occur in cattle during persistent infection . However, persistently high antibody levels have been reported in sheep following immunization [31, 48], recovery from experimental heartwater , and natural field exposure [21, 47]. Thus another possible explanation might be that, if vertical transmission is occurring in small ruminants, the resulting infection in the offspring is atypical in some way and does not result in the persistently high antibody levels seen after experimental or tick-transmitted infection. Immunotolerance to the infectious agent, reported in cattle following pestivirus infection (Bovine Viral Diarrhoea), develops when the virus invades the foetus before development of immune competence resulting in a lifetime of persistence of infection . In this case, the agent is persistently present in the blood without detectable antibodies, which phenomenon, with respect to E. ruminantium infection, could be possibly occurring in some extensively managed small ruminants as well; and it could be a mechanism by which vertically E. ruminantium-infected offspring survive/tolerate the infection. This requires further investigation. Alternatively, the possibility of vertical transmission resulting in time, in mortality, in immunosuppressed animals due to starvation, haemonchosis caused by Haemonchus contortus  or trypanosomosis [51–53], all of which are common in small ruminants under the traditional husbandry system, should not be entirely discounted. Indeed, mortality due to confirmed cases of heartwater has been observed in sheep after 3–4 weeks of quarantine in tick/insect proof stables prior to use in heartwater vaccination experiments at ITC. These sheep tested E. ruminantium-positive by nested pCS20 PCR described above suggesting a carrier status which in time, resulted in mortality possibly due to stress factors such as confinement with inadequate nutrition (authors' unpublished information). Furthermore, in this study, results of the pCS20 PCR and MAP1-B ELISA did not always agree (r s = -0.1512; P = 0.003); similarly the kappa statistic determined for the various age categories (Table 7) indicated little agreement between the two assays with agreement ranging between less than is expected to fair, which can be anticipated as both tests target different bio-molecules. For instance, two animals (#2351 and #2352) remained negative throughout the study by pCS20 PCR but tested positive by indirect MAP1-B ELISA; whereas from day 50 – 77 onwards, a number of animals that tested negative by MAP1-B ELISA were positive by pCS20 PCR. On the other hand, a number of animals that tested negative by pCS20 PCR were several times positive by MAP1-B ELISA (Table 2, 3 and 4), which seems to indicate the presence and persistence of maternal antibodies in those animals  or that the assay may be detecting antibodies to an uncharacterized closely related ehrlichial organism. This study demonstrated that mortality due to heartwater occurs in young indigenous lambs and kids under a traditional husbandry system in The Gambia as early as 4 weeks after birth. 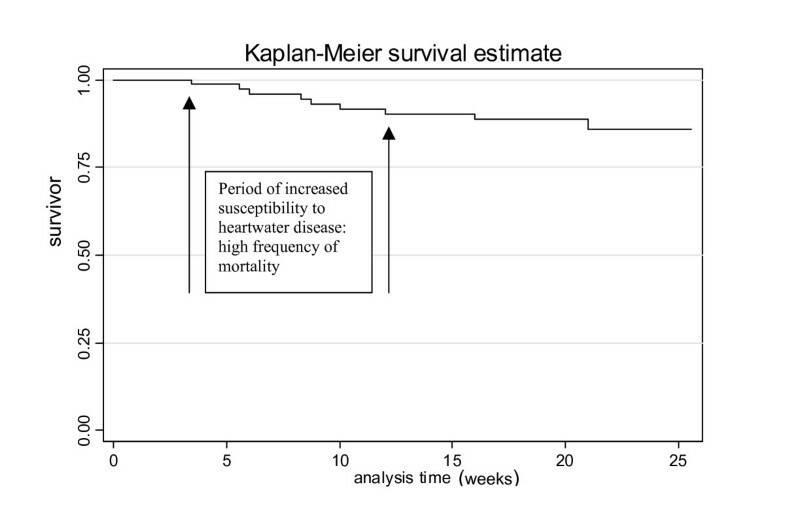 The frequency of mortality was highest in the animals aged between 4 and 12 weeks (Figure 1) suggesting a period of increased risk of/susceptibility to heartwater disease for these animals in this age group. This time interval appears to coincide with the period when the inverse age-related resistance in the newborn has waned. Furthermore, nearly all confirmed cases of heartwater mortality occurred in animals, which tested positive by PCR at 3 weeks of age, or older outside the brief period of inverse age-related resistance suggesting reduced resistance in these animals to any possible latent or new infection. On the other hand, the occurrence of heartwater-associated mortalities in animals prior to week 16, when ticks were first detected, could not be adequately explained. It is postulated that the deaths (8 out of 9) most likely resulted from vertical transmission itself due to possible immunosuppression in the affected animals, or highly unlikely though, that there must have been ticks infesting these animals prior to week 16 which were not detected, and which could have resulted in the positive pCS20 results. The findings of this study suggest that both the vector and vertical transmission may play a vital role in the epidemiology of heartwater supporting the view of previous studies [1, 9]. Although this would require further investigation, the data presented here, coupled with the traditional system of management of neonatal lambs, kids and their dams in The Gambia seem to support the conclusion that vertical transmission may be crucial in the initial establishment of endemic stability to heartwater in indigenous young sheep and goat population exposed to continuous field tick challenge. The study also supports earlier reports that single-occasion testing of a field-exposed animal may not confirm its actual infection status  and the use of pCS20 PCR supported by transmission studies and clinical data would help provide more accurate information on the epidemiology of heartwater (E. ruminantium infection) in endemic areas. Additionally, it showed the age range of increased susceptibility to heartwater in traditionally reared small ruminants which information could enhance better targeting of disease control measures especially through vaccination. Bonto Faburay, Dirk Geysen contributed equally to this work. This work was supported by The European Development Fund, contract no. REG/606/1006. We acknowledge the support of Utrecht Scholarship Programme and the ICTTD-2 concerted action project through the INCO-DEV program of the European Commission under contract no. ICA4T-2000-30006. We thank Dr. Cornelis Bekker for his useful comments on the manuscript. The support of Ansumana Ceesay, Saja Kora, Nuha Bojang, Dr. M. Mbake and the late Baba Drammeh is acknowledged. Bonto Faburay holds a Rothamsted International African Fellowship Award. BF performed the serology and PCR tests; participated in the coordination and management of the study; contributed to the conception, design, and acquisition of data; did the analysis of data and wrote the manuscript. DG contributed to the conception and design of the study and critical revision of the manuscript; participated in the management of study. SM contributed to the design, coordination and acquisition of data. LBS contributed to interpretation of data and revising the manuscript. FJ contributed to the design and management of the study and revising the manuscript critically for intellectual content. All authors gave their final approval of the version to be published.